I got my open water certification this summer in Cabo Verde (Africa) and due to timing and a few other restrictions (cash-ola! ), I was only able to complete 5 dives, of which 4 were solely for training purposes. So imagine my excitement when I realized I would be able to earn my Advanced Open Water certification here in Malapascua AND THEN START DIVING! Actual serious diving, not just practice dives! Woohoo! Usually how it works is that folks volunteer with People and the Sea for two to three weeks, and since they have only a short amount of time here, they often arrive having already been trained in Advanced Open Water. But luckily for me, I arrived at the same time as another volunteer, Olivia, and we both still needed our training so Dom, the awesome Expedition Manager / Dive instructor, was tasked with our PADI training. So basically for three days, we did our training dives in the morning and got to see a little bit of the marine life in Malapascua. In the afternoons, Glyn, the Science Officer, led lectures so we could learn to identify everything on the reef. Well, I say “everything” but there’s far, far too much to know it all. PepSea has specific items that we need to know and watch for such as types of coral, invertebrates and fish, and we were trained on how to identify these key items, as well as how to code them during science dives. Me (left) and Olivia, practicing the benthic survey. Me in the water, not looking exactly 'mermaidesque'! Glyn (bottom right) showing me and Olivia the different types of benthos.
!) 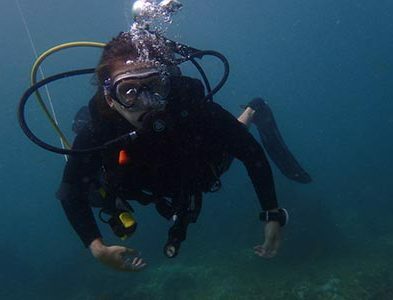 – the volunteers aren’t going on fun dives the way most of the tourists are. Instead, the dives are geared towards taking data at specific survey sites. The data goes into one of Glyn’s monstrous spreadsheets, and then gets processed into reports that can illustrate reef growth or decline from year to year. 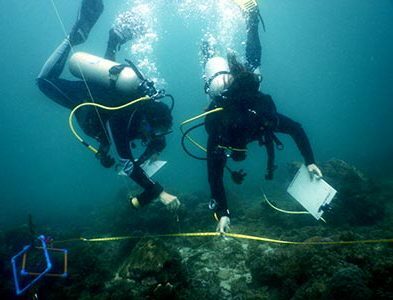 Once Olivia and I got the Advanced certification under our belt, Glyn and Dom began taking us on “point out” dives: basically, pointing to things under the water and writing what they were on the slate, using the science codes for each item. Often it was a lot of MC (massive coral) or SMC (submassive coral) or SC (soft coral). And once we got good at the codes and identifications, we began practicing laying out the transects. PepSea has a bunch of sites they survey once a year (hence the need for volunteers! Dom and Glyn can’t do it all by themselves! ), and these sites are marked with rebar posts set twenty meters apart from each other. On the dives, Olivia and I (with help from the pros, of course) had to find the first rebar post, then reel out 20 meters of tape measure to the other rebar post. Then, we laid a “belt” transect, a five meter tape measure laid perpendicular to the 20m one. 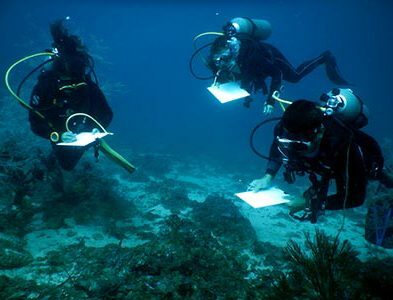 Once everything was in place, we could begin practicing the actual surveys: noting down fish, inverts, corals etc. And, what can I say, after 20+ dives, we’ve gotten pretty good at it. I’m even looking less like a flailing maniac and more mermaid/Olivia-like. Now that we’ve had some practice, we can complete a survey in an hour or less, which is the max dive time anyway so good for us!